One of Bojack's henchmen. 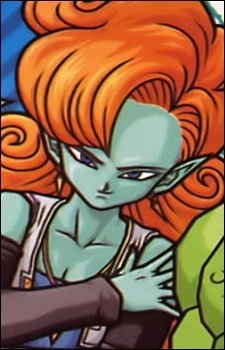 She is a female member of the Race of Hera, with long curly orange hair and pointed ears. Her name is derived from the Japanese word zangyaku, which means "cruelty" or "brutality." Like the rest of the Galaxy Soldiers, Zangya is extremely powerful. She, Bujin, and Bido are able to overcome Full-Power Super Saiyan Gohan by ganging up on him, and she is briefly shown fighting evenly with Future Trunks.